When it comes to massage there is a vast amount of descriptions and explanation, such as ours below, however regardless what you name it and like – sports massage, deep tissue release or soft tissue manipulation – does it really matter? We want you to feel better and thats our aim. More mobile, less stressed and and ready for action. This will help reduce aches and pains, whether caused by sport, injury, or the many stresses and strains of modern everyday life. Deep tissue or sports massage is a targeted treatment incorporating a range of techniques, including stretching, neuromuscular (trigger point therapy) and myofascial release to address musculoskeletal pain and dysfunction. Although most people associate the term ‘sports’ massage with this type of therapy, I also use the term deep tissue, as many people are affected by muscular problems without participating in any kind of sport. Repetitive movements that are part of everyday life, such as driving, using a PC or fulfilling caring responsibilities can all lead to muscular problems. 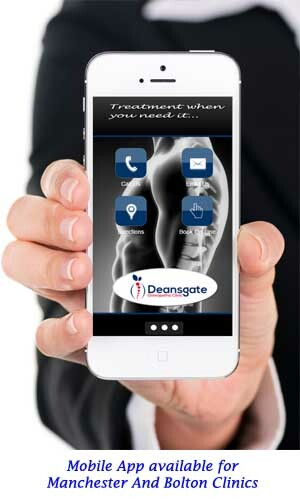 We have male and female massage therapists, regardless of who you see at the Deansgate Osteopathic Clinic you will receive a consultation that will dicuss how long the problem has existed for, what causes it and home care advice, pain can usually be reduced or sometimes alleviated completely, and range of motion increased, while tissue swelling and inflammation can be reduced and function improved, and don’t worry if we have a difficult case or more comprehensive treatment is needed we can call upon the watchful eyes of the osteopaths or physios. The number of sessions vary and some chronic conditions will take longer to address. The vast majority of musculoskeletal problems can be addressed in somewhere between one and six sessions. Treatment length is 30 minutes or 60 minutes. We have massage therapist’s available on Monday’s & Wednesday’s.